I am now a Creative Memories Consultant!!! 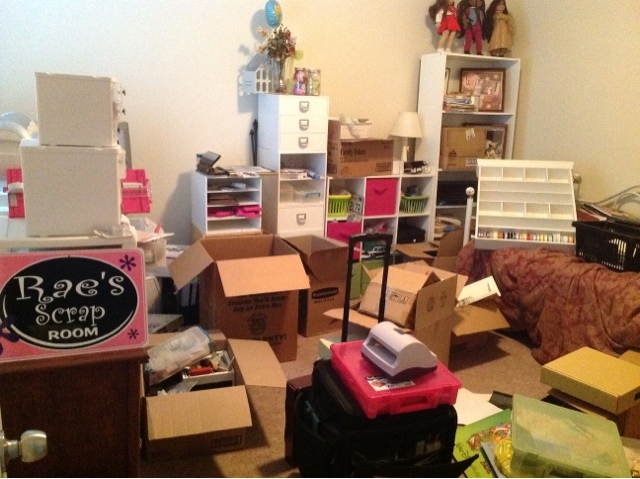 Ms. Rae's Scrap Space BEFORE! In celebration of my forty eighth birthday, I traveled to my home state of California for a week to visit my family and best friend. I spent the time scrapbooking with friends, driving up the coast of California, visiting my in-laws, cousins, relaxing and truly enjoying my best friend. 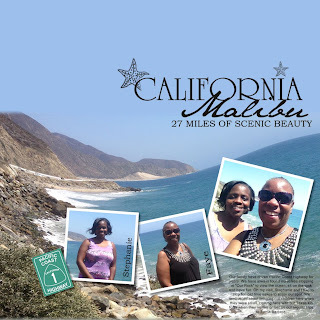 On my drive up to Central Coast California, my cousin and I stopped at our family stop, the Malibu Rock. For years, our family has stopped at this rock on our travels up and down the coast. For us, it brought back memories of our children in their youth and time spent together. I love this layout because it shows my favorite cousin and I together in the beauty of this spot on Pacific Coast Hwy. I also enjoyed trying one of Pixel2Pages technique challenges that keep motivated. In this photo, I distorted the wave of the ocean a little to give it some motion. I also, use a portion of a template for the photos and challenged myself with some digital titling in Creative Memories StoryBook Creator which has become my ultimate favorite tool. I hope you enjoy the layout as must as I enjoyed creating it. 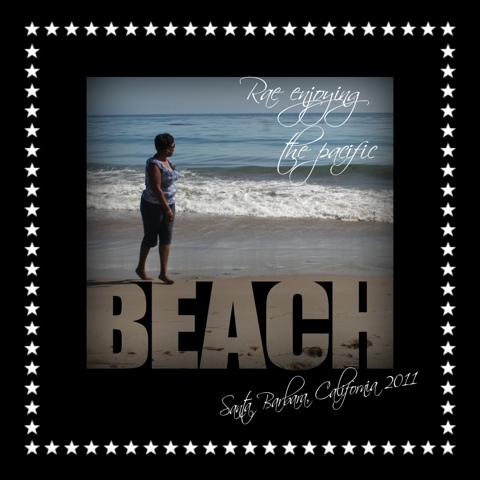 Layout done in Storybook Creator 4.0 - Ms. Rae on the Pacific watching herself in the world. After much prayer and thought, I have joined the Creative Memories family. I'm so excited. It's so funny but its actually where I got my start scrapbooking over 20 years ago. I look at my daughter and can't believe she's 23 and I started when she was a baby... making a CM album that is my pride and joy today. 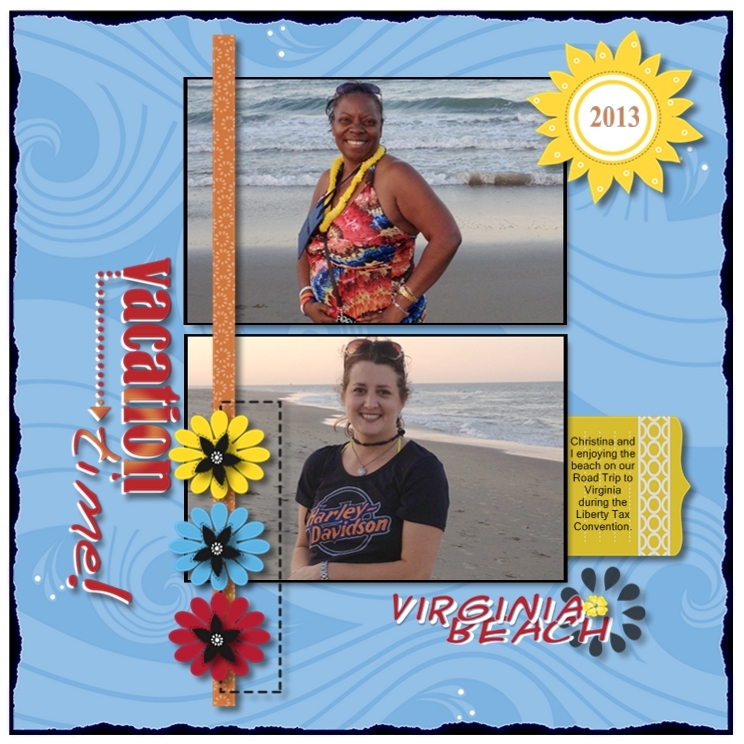 I joined CM because I also love digital scrapbooking and their Storybook Creator Software has me hooked. I've loved Photoshop for years but this program gets me going fast and does so much that I can't stop using it. I also have a wonderful support team that I already enjoy working with. Watch as I share my creative ideas digitally as well as traditionally. Feel free to share your scrapbooking ideas, questions and projects. Also visit my website www.myCMsite.com/MsRaes for all the great products that Creative Memories has to offer. Thanks again for all your love and support of my endeavors over the years. Be blessed. I need motivation to get it done. So here goes. This is how my space look today. I need my space back. Those boxes are full of scrapbooking supplies not to mention the closet. So off the computer and to work I go. Pray for me! As promised here is one layout created from following Patty's book. 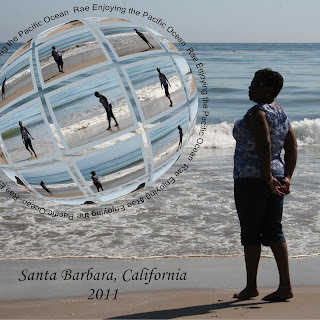 Using a Photoshop Element template I was able to make this beautiful page of me enjoying the Pacific Ocean in Santa Barbara, California on a visit last year. It demonstrates how to make words out of your photos and blend them together. Its a great effect that I plan to use over again with other techniques. CKC Houston - Great Show!!! MIA Again!!!! I know, I'm sorry. I'm BACKKKKKKK!